We featured Raphael "Raffy" Marascio recently, and called him the future of MMA. 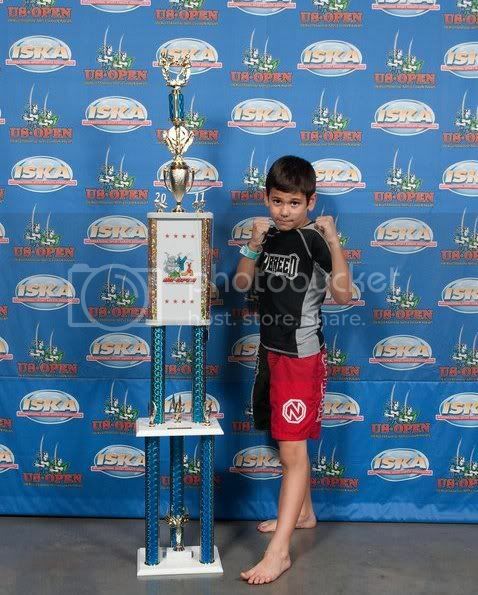 Well, it looks like the future is now, because Raffy just won the 2011 ISKA World Sport MMA Championship in the 8-9 year old division for kids under 90 pounds. Raffy weighs only 59 pounds and had to beat much bigger kids to win the title, which he did and in amazing fashion. Raffy is managed by Victory Sports Management, of which I am a partner, and I'm excited to be a part of Team Raffy. My partner Gary Marino and I do not charge anything to help guide Raffy's career. We are just thrilled to be involved with this kid because he's not only a very talented fighter, he's a great kid. And his dad Matthew is doing a masterful job of guiding him and nurturing the champion within. Here is a video of Raffy dominating a much larger opponent at the ISKA tournament. His takedowns are brutal!